The second scientific cruise of the 2018 summer season sets off to the Arctic Ocean today. 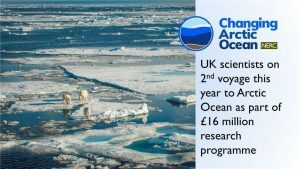 It is part of the £16 million, UK flagship research programme the Changing Arctic Ocean, funded by the Natural Environment Research Council (NERC). 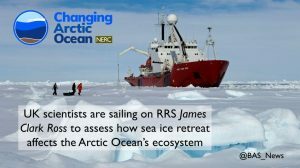 Scientists from institutes across the UK are boarding the RRS James Clark Ross to head to the Barents Sea. 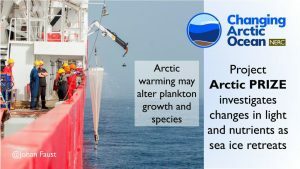 There, they will work with colleagues from Norway and Germany to look at the effects of warming on the Arctic Ocean, from the surface of the ocean to the seafloor. With warmer winters across the polar region, the Arctic Ocean is now experiencing year-on-year record lows of sea ice. These changes are having an unprecedented impact on how the Arctic ecosystem operates. The retreat and thinning of Arctic sea ice is a key driver of change, increasing the amount of light in the ocean and encouraging mixing that brings deeper, nutrient-rich waters to the surface. These are two key determinants of productivity in the Arctic Ocean that the entire food chain relies on. 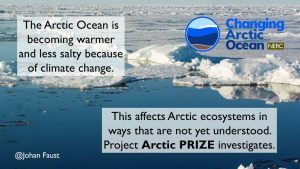 It is important to understand how climate change is altering these properties and to quantify their impacts on the Arctic ecosystem if computer models that predict future change are to be improved. 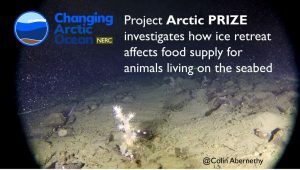 Scientists from one of the programme’s projects (Arctic PRIZE) will spend a month at sea measuring the physical, chemical and biological properties at different depths in the Barents Sea. Their aim is to identify if significant changes are happening on a seasonal basis that alter the way plankton behave. These organisms form the lower part of the food chain and are vital to the survival of larger animals, such as fish and seals. Their growth during the spring/summer transition is dependent on the right nutrient mix in seawater and sufficient light. Climate change may alter the timing, location or amount of growth by the plankton, even drawing in different plankton species from more southerly locations, with unknown consequences for the rest of the food chain. A central part of the scientists’ work involves collecting automated instruments that have been moored at sea for the last 12 months. These will be redeployed for a further year to collect vital data on how changes in sea ice are affecting important parameters in seawater, like light intensity. 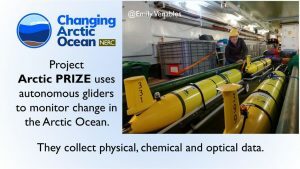 The scientists will also collect an autonomous glider that has been monitoring the open water south of the ice edge since January – deep in the polar night. It has been collecting data on the physical, chemical and optical properties of the water during the critical transition period from winter to summer. This allows the scientists to identify how the plankton are responding to seasonal change in an environment influenced by warming. We are working in partnership with Norwegian scientists, particularly in Tromsø, to observe how the Arctic ecosystem responds during the winter to summer transition as the sea ice retreats to the north. Together we are refining our understanding of these Arctic environments. 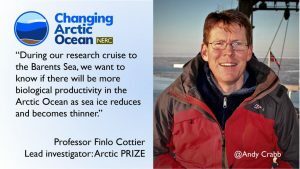 One of our key questions is whether there will be more biological productivity in the Arctic Ocean as ice reduces in area and becomes thinner. We have a very integrated programme of work that connects the physical environment of ice, water and light to the chemistry to the organisms in the water column and to the seafloor communities. The Arctic is rapidly changing, with ice retreat resulting in an ocean of warmer, fresher and lighter water. We know that some zooplankton are shifting habitat ranges northwards, but migrating could come at a price. Heading north the day/night cycle is altered and this in turn will affect their biological clocks that control everything from their behaviour to their genes. Our aim is to understand how resilient they are to such change.